Emily Dickinson has been on my mind since I just installed a set of digital compositions combining hand-lettered lines by the poet with kaleidoscopic flower imagery at the Newton Free Library in Newton, MA. This month's project is small book in celebration of Emily Dickinson. You can put one poem in the book, or a collection. I was inspired by Emily Dickinson's fascicles, small booklets into which she copied more than 800 of her poems. 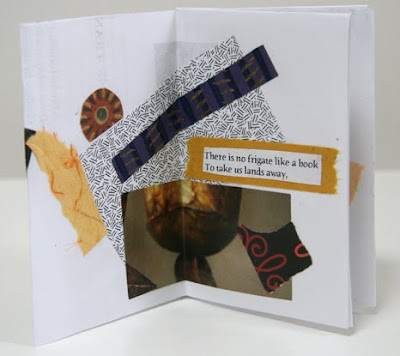 While Dickinson made the small volumes from folded sheets of paper that she bound with string, this book is a simple fold and cut book that I call the Hot Dog Booklet with papers from the collage box and lines from the poet. A wonderful site with information about visiting the Homestead in Amherst, MA (a wonderful experience) and lots of information about Emily Dickinson and her poetry. Jeannette Winter frames a short collection of Emily's poems with the story of her sister Lavinia finding the poems after Emily's death. Jane Yolen tells a beautiful story of poetry, love, and truth-telling based on a poem and dead bee that Emily Dickisnon gave to her six-year-old nephew, Gib. Michael Bedard tells another story of Emily's connection with children is told here by a girl who lives across the street. Elizabeth Spires wrote this delightful small chapter book about a mouse who lives in Emily's house and is inspired to write poetry. As the white mouse Emmaline describes herself: "Before I met Emily, the great poet of Amherst, I was nothing more than a crumb-gatherer, a cheese nibbler, a mouse-of-little-purpose.